- Best of all, Google Play Gift Cards never expire! Any refunded Google Play amounts, if applicable, will be credited back to your Google Play balance for Gift Cards for future use under these terms of service. Google Play gives you instant access to all of your favourite entertainment across all of your compatible devices. Watch your favourite movies, download Android apps & games, and explore the world’s largest selection of ebooks without using your credit card. Buy this Google Play Gift Card and redeem it to add USA 50$ balance to your Google Account. 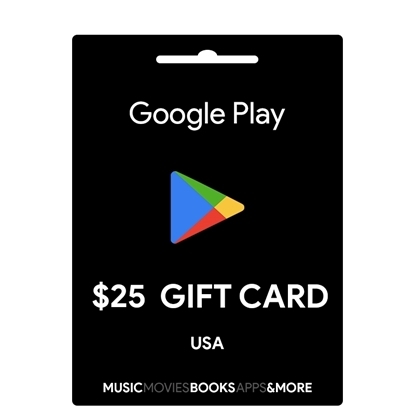 When you give Google Play Gift Cards to yourself or your friends and family, you/they can choose whatever they want from the Google Play Store on their devices like Movies, Music, Books, Apps, Games, In-App purchases etc. So your recipients can get exactly what they want. 1.This Gift Card is a single-purpose facility only. The Gift Card may be used for purchases of eligible items on Google Play only. Limits may apply to redemption and use. Items ineligible for purchase using Gift Card include certain items in the “Devices” section of Google Play (e.g., phones, tablets, and related device accessories) and certain subscriptions. You can get Google Play gift codes by email, physical gift cards, or other methods of delivery. Find where to buy gift cardsor digital gifts. When you redeem this code, the gift will add to your Google Play balance. You can also get Google Play promo codes, which can add to your Google Play balance or give you specific apps and digital content. Note: to use a gift card or promotional code, the country of your Google Account must match the country where the gift card or promotional code is offered. If you see a message saying Google Play gift cards are not valid in your country, see the "change your Google Play Account country" section below. If you received a Google Play gift via email you can redeem it from the gift email. Find the email you received from the purchaser of your gift. Note: If you deleted or can't find the email, contact the purchaser and they can resend the email to you. Go through the checkout process until you see the payment method listed. Redeemed gifts and some promo codes appear as part of your Google Play balance. This can be used for many purchases on Google Play. Find information on the types of content you can buy with Google Play balance. Type your address and select Save. Find the section named Country. Make sure the country matches your address. The Google Wallet mobile app, or a Payments Merchant account.